Every presentation has three parts; Content, Design and Delivery. Content is what you want to say, Design is how you arrange it and Delivery is how you say it. That's the best way of defining these elements of a presentation. While making any presentation you should give equal emphasis to each element. Oliver Adria's recent blog post talks about Content Design Delivery in a new light. He has introduced an interesting concept. He calls it the 'Presentation Triangle'. Presentation traingle helps you analyze a presenter. It also helps you improve yourself as a presenter. Knowing where you stand in the traingle gives you a sense of what are your areas of improvement. 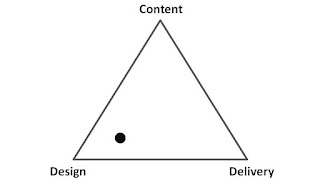 The best place to be in the traingle is in the centre; a perfect balance between Content, Design and Delivery. When you give them equal emphasis and do not falter on any. How do I know where am I in the triangle? You cannot ask this to yourself. It's best if you ask your friends and colleagues who have seen you present. Knowing where you lie in the traingle is the first step to start improving. Once you know where you lie and what you lack, you have a much clearer idea of how to become better. Do you know how good a presenter are you? Where do you excel and what would you like to improve? Leave a thought. thanks a lot for putting up my post as "Pick of the Week". You have a nice web site here. With all the bad PowerPoint slides around the world, the more good design ideas, the better :-). Best of luck to you and I'll be stopping by every now and then. Thanks for the feedback. Keep visiting.